I made my annual pilgramage to Stitches on Friday. 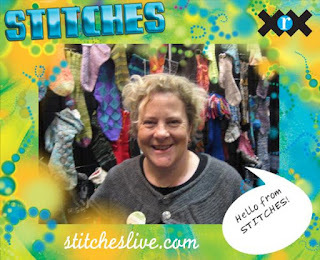 For those who don't know Stitches is a knitting convention - approximately 7000 people crowd into the Santa Clara Convention Center over three days to attend classes, buy yarn, and generally mingle with a crowd who ask what pattern your sweater is! I went alone, but met many friends, and made some new friends. I just planned to look and shop (no lessons) but didn't have too much in mind to buy. 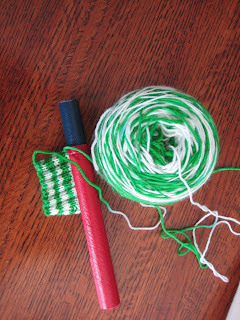 The '1970s appliance' green is a Fleece Artist Sea Vines kit - seawool and a pattern for a sleeveless vest, the brown yarn is from Sweet Grass Wool and is a largely untreated aran weight yarn. I bought enough for a sleeveless/short sleeved vest. I had a lot of fun - but came home about 3pm exhausted. I cant think how people stay there all day, or all weekend! I have been dying to introduce sticky-backed-plastic* into my repetoire...and finally a chance to do so. 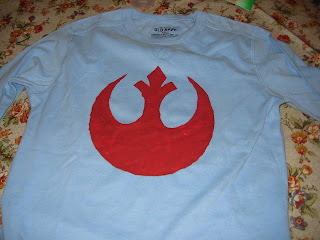 I had been talking with the boys about creating some stencilled tops for themselves - using a technique of cutting the stencil into freezer paper and then ironing it onto the t-shirt as a resistant area for fabric paint. Anyway, it turns out that freezer paper is pretty well unknown in Los Gatos so I ended up using sticky-backed-plastic, which worked pretty well. The boys selected images for themselves online, mostly we searched for "Star Wars Stencils" which turned up some very fancy images and some more workable ones intended for pumpkin carving. They chose the colour shirt and fabric paint. I carved the stencil using a sharp scalpel on a cutting mat. 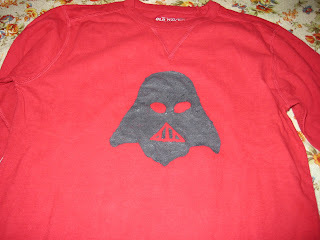 We simplified the Darth Vader design; I traced the outline with a sharpie and made our adjustments. We stuck the contact paper carefully onto the shirts and the boys then applied the fabric paint. We used special stencil brushes which have a hardish blunt end, and a "pouncing" technique which is more like dabbing the paint on, this make sure that the paint does not go under the edges of the stencil. If you do this at home, make sure you put something (piece of card) between the front and back of the t-shirt as the paint will otherwise seep through to the back. We let the fabric paint dry and then carefully peeled off the contact paper. They boys are really pleased with the effect - they are planning to wear them tomorrow when the meet a friend who will understand all the Star Wars symbols! It was a fun project and successful. Although I had to cut the stencils for them, it did not take long, and they had been involved in all the decision making. After we completed the shirts Adam commented that he now understood why I had been advising against some of the more complex designs. He had not understood my explanation of why it would be hard - but having seen the stencils work he now agreed that too many details would not look as good. Maybe they would have done better if they had Finlay's socks? 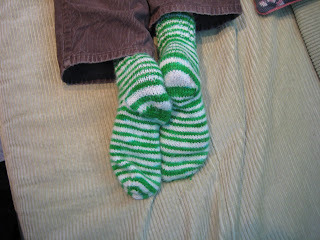 Completed socks using my normal recipe for my son's enormous feet (7"). 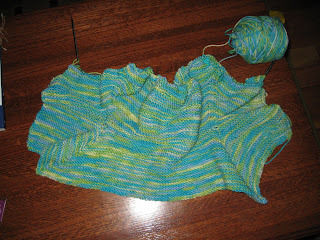 The yarn is Knitpicks Bare superwash sock, dyed by Finlay and I using food colouring. This was the only position I could get him to pose in, and every time I tried to straighten the socks he said it tickled and wiggled around...so I'll call it an artistic shot. * Rangers held Celtic to a scoreless draw on Sunday in the "Old Firm" match between the two Glasgow football teams. Thanks to Christina for pointing out that the socks are Celtic colours. I am getting on with the FLS. 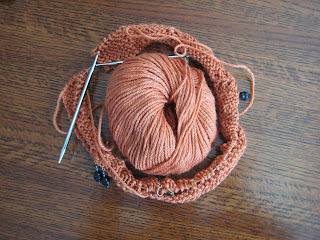 So far I am really enjoying the knitting - the lace pattern is simple enough to be knitted in autopilot - but more interesting than stockinette, and the colour is lovely! Since I started this another 155 people have knitted it on Ravelry... I do love to be on a bandwagon! 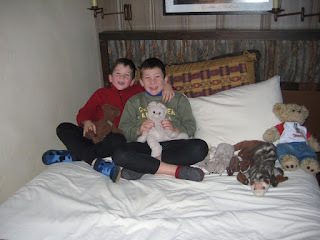 Finlay was home sick a couple of days this week. Because we were both busy at work he had to entertain himself (without the TV, computer, or DS!). 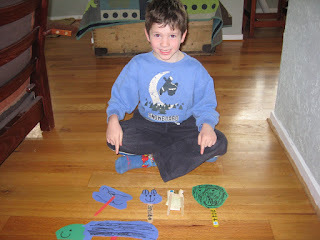 One of his activities (which occupied him for hours) was creating this set of puppets. 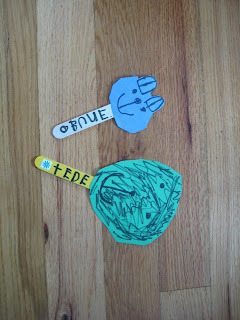 They represent his and Adam's favourite soft toys and are all clearly labelled. He thought this up himself and completed the project without any help. 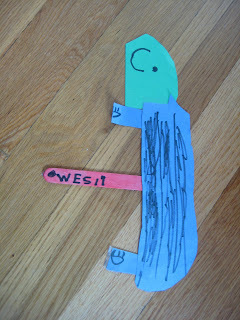 He plans to put on a puppet show with Adam this weekend. You can compare them to thier namesakes pictured below. Previously in "on the needles" I have showed off this item... claiming it to be a baby garment. Well, here it is all finished off. 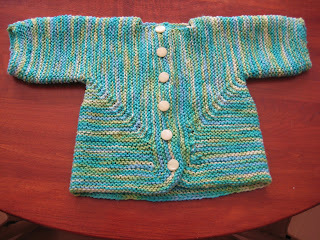 The pattern is Elizabeth Zimmerman's classic Baby Surprise Jacket. Knitted in Cascade Superwash paints. Buttons from my tin! It's intended for Adam's 1st grade teacher who is expecting her first baby in April. She is a beginning knitter so I think she will appreciate this. I've been doing a little knitting of small items lately. 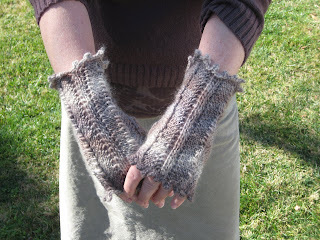 These are Miss Potter's Mittens from the Yarn Forward magazine knitted in Rowan Tapestry in colour 170. They worked out very pretty if a bit frilly for me - however Christina assures me that they are not too frilly for her, and since she sent me the wool, that works out nicely. The pattern had errors in, but it was pretty easy to correct them (error in the thumb guesset). The yarn is really pretty, but I found it rather splitty to knit with. This hat was a last-minute choice. 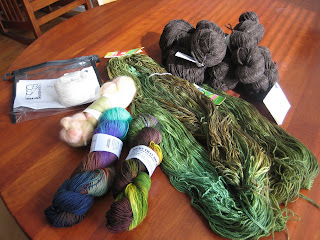 I bought the yarn: Green Sheep organic rambouillet from Green planet yarn when we attended the sock machine demo. Its somewhat rustic, but still resonable soft. 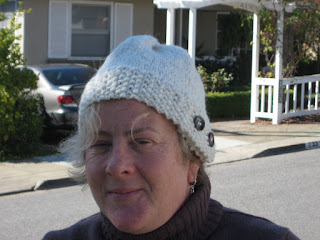 The pattern is an adaptation of the robins egg hat with adjustments for tension. I really like the button trim, buttons from my tin! Finally, I also finished these socks. They have been on my sock needles for ages, for no real reason. Its a basic 3 x 1 rib knitted according to my usual recipe. These socks are for me. The yarn is from Lynne and it's her own dyed yarn. She sells it through her web site and also through her Etsy shop. If you have not used Etsy before it's worth a look for hand-crafted items. I had a key chain made for Nigel for our anniversary at a very reasonable price. Anyway the yarn is 75% wool/25% nylon, nice and soft, non-splitty, and I love the chocolate cherries colour. Well I am joining the other 3902 (and rising) people on Ravelry who are knitting the February Lady Sweater. It's a free pattern available from Flintknits for a 3/4 sleeved, swingy, lace cardigan. 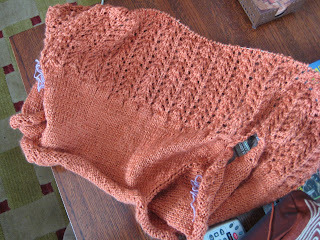 I am knitting it in Elann Highland Silk in Pumpkin colour. I bought this yarn for $30 for a bag of 10 balls and have been hoarding it for about a year. This week someone emailed me to see if they could buy it to add to their own bag. I didn't want to sell it - but it did prompt me to actually cast on something with it. A couple of weeks ago the boys and I were at a loose end and decided to start our sock dying project. Ages ago I bought some undyed sock wool from Knitpicks with the intention of the boys dying it and me knitting the result into socks. Finlay and I had previously tried to dye it using beetroot (Beetroot) but the resulting pale pink was not an option for socks for Finlay. 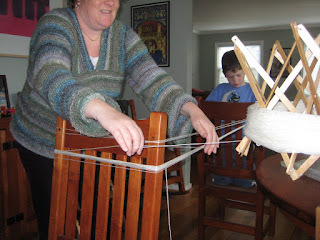 The boys wanted socks with actual stripes, so our first step was re-skeining the yarn into long skeins. This step was not as easy as I expected (or hoped) and the yarn got hopelessly tangled both during this and the re-winding phase! We then dyed the yarn using Koolaid and food colouring. We soaked the wool in a strong vinegar solution as a mordant, then dyed the yarn in 2 halves. Adam chose blue and orange koolaid, Finlay chose green food colouring, then lost interest! 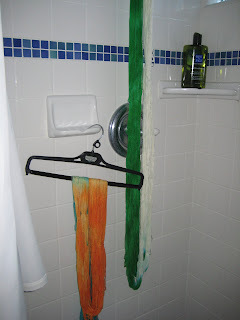 Here is their dyed yarn drying. 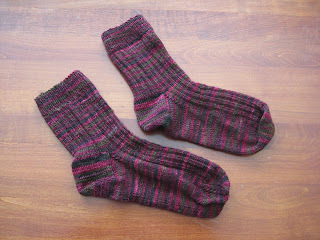 I have already started Finlay' socks. I managed to actually create a longer skeing with this yarn and so the stripes are really working out well. Adam's yarn is likely to be a more mottled effect as the skein was much shorter. The difference between the skeins might well be attributed to me winding Finlay's skein without assistance! !